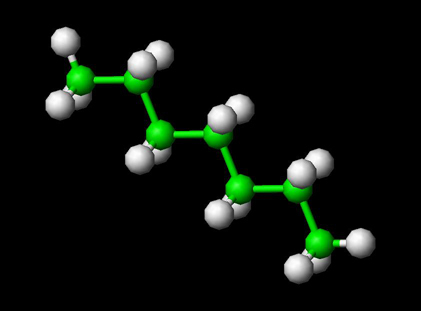 n-Heptane is the straight-chain alkane with the chemical formula H3C(CH2)5CH3 or C7H16. It is the zero point of the octane rating scale. Heptane (and its many isomers) is widely applied in laboratories as a totally non-polar solvent. A liquid, it is ideal for transport and storage. In the grease spot test, heptane is used to dissolve the oil spot to show the previous presence of organic compounds on a stained paper. This is done by shaking the stained paper in a heptane solution for about half a minute. Extraction into heptane is a means by which aqueous bromine may be distingiushed from aqueous iodine. In water, both bromine and iodine appear brown. However, iodine turns purple when dissolved in heptane, whereas the bromine solution remains brown. Heptane is commercially available as the rubber cement solvent "Bestine" and the outdoor stove fuel "Powerfuel" by Primus. n-Heptane is the zero point of the octane rating scale. It is undesirable in petrol, because it burns explosively, causing engine knocking, as opposed to branched-chain octane isomers, which burn more slowly and give better performance. It was chosen as the zero point of the scale because of the availability of very high purity n-heptane, unmixed with other isomers of heptane or other alkanes, distilled from the resin of Jeffrey Pine and from the fruit of Pittosporum resiniferum. Other sources of heptane and octane, produced from crude oil, contain a mixture of different isomers with greatly differing ratings and do not give as precise a zero point.